Isachesen Stadion is a Norwegian football ground located in Mjøndalen, Nedre Eiker. Previously known as both Nedre Eiker Stadion after the local area and Mjøndalen Arena after the resident football team, the 4,350 capacity ground first opened in 4,350. At the start of the 2011/2012 season the playing surface was converted from natural grass into a form of artificial turf in order to decrease maintenance costs and to minimise disruptions to the footballing calender as a result of the cold Norwegian climate. The most recent renovations at Nedre Eiker Stadion occurred on the back of Mjøndalen’s promotion to the Tippeligaen in 2015 after a 3rd place finish in the Norwegian First Division. Additional seating was installed to increase the capacity to 4,350 and the stadium’s naming rights were sold to the building contractor, Isachsen Gruppen. To date the record attendance sits at 15,300 – a record which is unlikely to ever be beaten as Mjøndalen’s glory years of European Football were very much in the 1960s to the 1980s. Images of each individual stand to be added soon. Away fans (Bortesupportere) are housed within the south stand within seating sections R, S, & T as per the above seating plan. Tickets for the visiting supporters can be purchased from the ticket booth right outside Ingang (South-East) 3. The club shop at Isachsen Stadion opens two hours before kick-off on matchdays, and on a few special days throughout the year as advertised on Mjøndalen IF’s facebook page and official website. It doesn’t appear as if there are any tours available of the recently upgraded facilities at Mjøndalen Arena. Tickets to see Mjøndalen IF play at home can either be purchased online from the club’s official website or in person at the stadion before kick-off on matchdays. 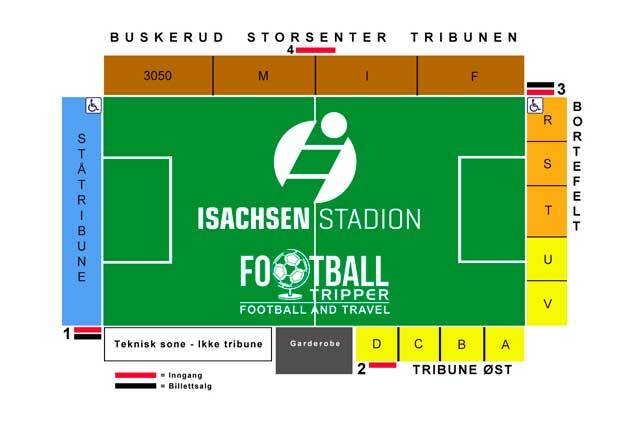 Expect to pay 180 NOK for a terrace place behind the goal, and anywhere between 200 – 400 NOK to sit within the main grandstand. Isachsen Stadion is located centrally within the small village of Mjøndalen IF less than 500 metres from it administrative centre and 750 metres from the main railway station. From most locations in the city centre the average Football Tripper should be able to walk to the ground in around 10 minutes. There appears to be a few medium sized car parks in the area surrounding Nedre Eiker Stadion. Mjøndalen station sits on the Sørlandsbanen line which is approximately 70 km away from Norway’s capital, Oslo. Bus numbers 52 and 53 stop at the two main roads close to Mjøndalen Arena: Drammensveien and Hagatjernveien. The two closest major airports are Moss Aiport (60 km) and Sandefjord Airport (65 km). As there are no hotels within the municipality of Mjøndalen you will have to drive eastwards along the E134 or catch the train to the larger urban area of Drammen. Three accommodation options here are the Comfort Hotel, Globus Hotel and Rica Park Hotel.